Dexa Scans weren’t always the gold standard, however with the improvement in technology it it starting to make a big name for itself. With all the options out there today, trying to discover your body composition can easily become an overwhelming project. You could use calipers, or hydrostatic testing, or bioimpedance scales… the list goes on. Yet somehow after spending the time and money, you’d still manage to get completely different numbers produced from each of these tests. 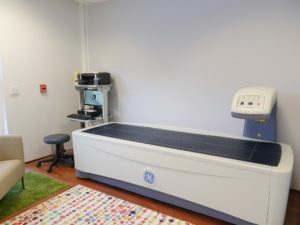 Frustrating, but before you slam your laptop closed in dire fear that there’s no hope of accuracy, take a look at what we have to say about a technology that’s revolutionizing the way that body composition is measured – DEXA. DEXA technology is making a steady rise to the surface of the health and fitness industry because it’s an accurate and noninvasive measurement – meaning no clippers pinching your body fat. DEXA provides you with more detail than just your overall body fat percentage. It has the capacity to segment your body, both when measuring fat and lean mass. This means you can see where you are storing the least and most fat, as well as see the amount of lean mass you have in different parts of your body. The dual-energy x-ray absorptiometry technology is revolutionary for many reasons – it’s accuracy, it’s objectivity, it’s simplicity, you name it. But even further than that, DEXA is changing the way people perceive weight loss. People with the most fat loss success have learned the term “weight loss” can mean many things. Instead they focus on the phrase “fat loss.” DEXA makes the distinction between the two extremely clear because the data doesn’t lie. It’s great if you come in with a 10 pound weight loss, buttttt it’s less great if that 10 pounds came solely from lean mass, and not from fat. The DEXA can show you that. DEXA scanning is no longer a vision for the future, but the here and now of composition testing. Finally, we can move past the dark ages of calipers and bring body composition analysis into the 21st century. If you’re interested in finding out more about this revolutionary method of composition testing, we’re here to help! Love this! I’ll be back to reassess baseline!